Stitches: ch, sc, hdc, dc, tr. R1: Ch9, sl st in 2nd ch from hook. (5tr, sl st, 5tr) in last ch. Sl st at the point of the bottom of the heart to join. R2: Do not turn. Ch1, sc in ea st around the heart, placing 2sc in ea tr and a sl st in the top center of the heart in the same st as the trs you worked on R1. R1: Join w/sl st in a st on the left side of the heart (see photo). R2: Ch1, turn. Sc in both scs. Rep R2 until the tie is approximately 24" long. Fasten off leaving about 6" for sewing. 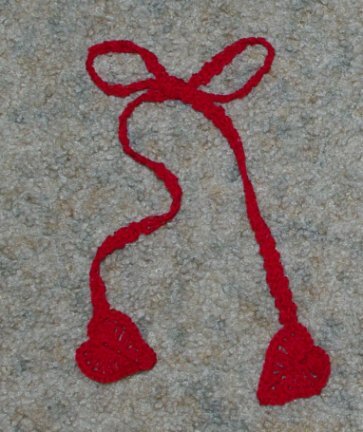 Using a yarn needle, sew the last row to 2 sts on the right side of the other heart.